After winding your way among the houses dotted along the hill which backs on from Sezaki harbor, you’ll make your way up to the Hinomisaki-jinja shrine grounds-in terms of location, this is a tough shrine to get to. According to the recollections of local resident, the late Mr. Ono Keijiro, up to 1962, the shrine grounds contained a 10m-wide old pine tree. No doubt this was a good landmark for the shrine. This Sezaki Hinomisaki-jinja is an ancient shrine which provides a lot of very important information. The Unyoshi refers to it with, “ Nisa myoujin, located in an area called Sezaki, the deity is Tsukutsumi no mikoto. Both this kami and this shrine name are exactly the same as the Nisa-jinja detailed in the Shimane district section of the Fudoki for the current day Chikumi. According to the shrine historical records, first the ‘kanjyou’ (transfer of a divided tutelary deity to a new location) ceremony took place at the ancient Chikumi Nisa-jinja. Later, during the Houei era in the 18th century, the transferred kami was then enshrined together with that of Hinomisaki-jinja. A point of issue is the fact that there are no records of any shrines bearing the name ‘Chikumi’ despite Chikumi having been an important posting station. 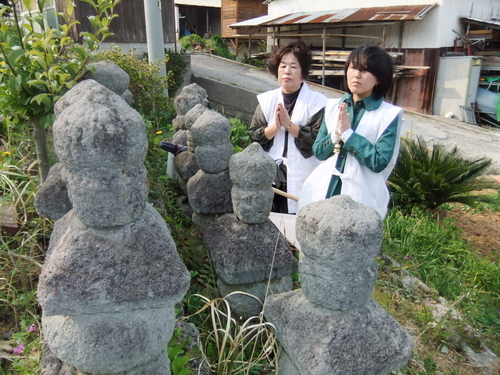 It should be remembered, however that the details of ten shrines were lost during the copying of the Izumo Fudoki. Based on this, if it is presumed that there was once a Chikumi-yashiro shrine in Chikumi, then it wouldn’t be out of the realms of possibility to suggest that this Hinomisaki-jinja was actually Nisa-jinja. The enshrined deity, Tsukutsumi no kami, does not appear in either of the two main Japanese historical records, the Nihongi and the Kojiki. In the Fudoki entry on the Chikumi posting station, there is mention of the kami being, ‘a descendant of Izanagi’ . One theory is that this kami is actually the moon god, Tsukuyomi. 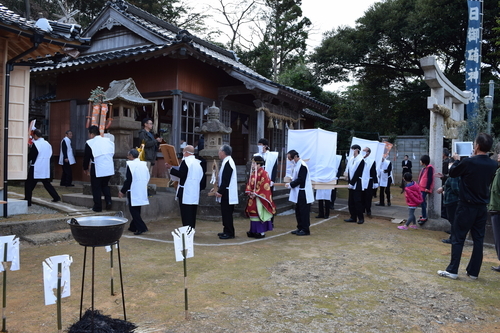 The Heisei 27 (2015) shrine rebuilding at Seizaki Honomisaki shrine was held back until the October when the temporary shrine relocation took place accompanied with a ‘yudate’ (Shinto ceremony where priests sprinkle water over worshippers using bamboo leaves that have been dipped in hot water). There was also a night kagura held there for the first time in three years. The night kagura included some well known performances and prayers for the prosperity of children born in that year culminating with the scattering of red and white rice cakes and sweets over the waiting crowds. It was a night kagura full of energy and zeal. Sezaki has the ‘Sezaki Lookout’ as mentioned in the Izumo Fudoki. The area can be seen after ascending the shrine and looking back from the torii gate. 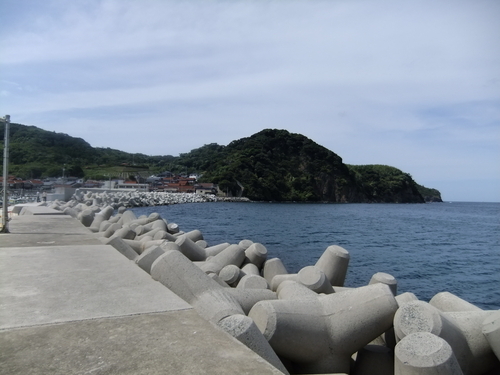 On the left side of the mountain is the ‘cape in the sky’, the catchphrase of the accommodation area Marine Park Takobana , the northernmost tip of the Shimane peninsula where on a clear day Oki island can be seen giving spectacular views. Oki is an advantageous spot. It is formerly a penal colony where outside intruders attempting to invade could be watched in advance. Sezaki is famous for being the spot where Emperor Go-daiji , known for his role in the Kenmu Restoration, is said to have arrived on upon fleeing Oki. Even now, various local legends are still passed on including the ‘Pine tree rope’ (said to be an old pine that ships lost at sea could cast ropes at for protection). In addition, during the Meiji Period abolition of Buddhist imagery, statues were said to have been ‘evacuated’ from Oki. 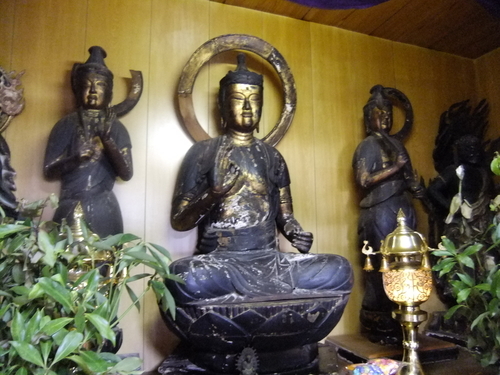 Now, five of these statues still exist in a retreat temple. The statues are said to be a little scratched after their ordeal but remain as strong imagery left over from the Kamakura period.